Q: What is RuCTFE Cloud? 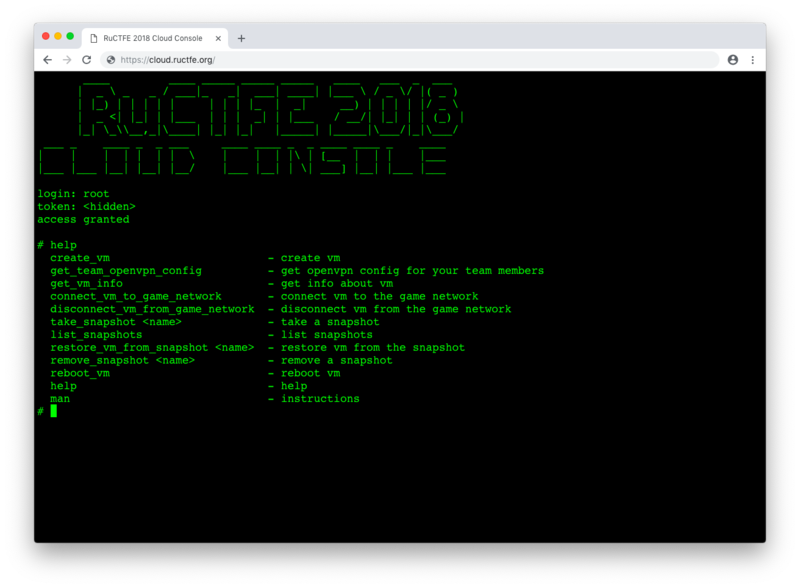 A: A year ago all RuCTFE participants had got the opportunity to deploy the image on our servers! No more pain with lingering ping, unstable internet, search for a server and its first setup. And, of course, it is convenient for geographically dispersed teams, which is more or less what our developers' team looks like :) It was a testing feature, but now we are sure that everything is stable. Q: But it's better to set everything up on your own server, and also it's not clear what the hardware will be. Is it still possible to take part in RuCTFE on your own server? A: Certainly it is! We really support this idea :) But for those who don't have an opportunity (or desire) we have created a comfortable interface for fast connection to game network and setup. Q: But couldn't the teams with their own servers have advantages because of more powerful computers? A: We provide the amount of computing powers enough for comfortable playing during 9 hours. At the same time, services are developed in a way that the difference in computing powers for teams could not crucially affect the final game results. Q: I do like that! What I need to do to deploy an image in RuCTFE Cloud?